It arrived and is really light at only 7lbs 4.5oz. Resonates wonderfully and has nice bottom end. 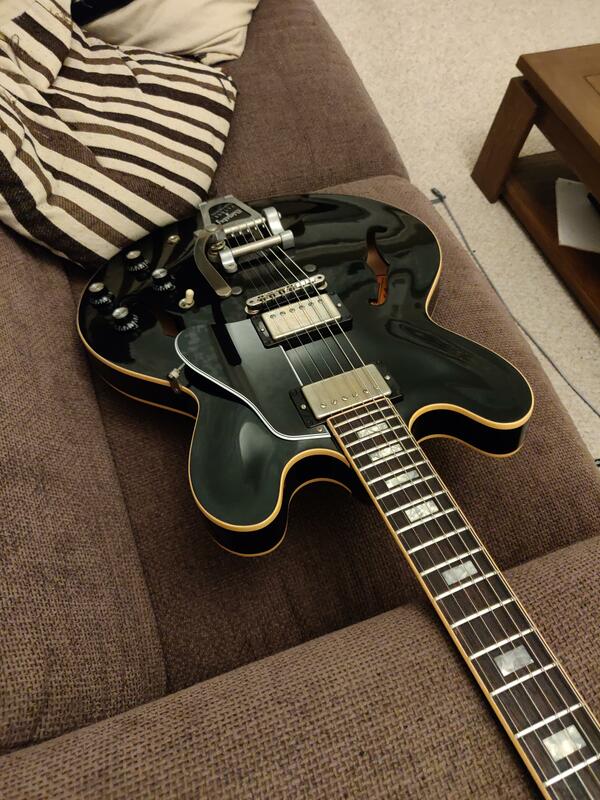 Definitely one of the better ES335s I’ve played. I’m also finding the neck surprisingly comfortable even though it’s thin. A nice bit of very light flame too on the back and top. Very pleased so far. Nice! I've had the 58 and 63. The neck on the 58 is massive. Bought it. I actually love the headstock and the fact it's not trying to be a fender. Always wanted a Tyler and it's as good as I thought it would be! 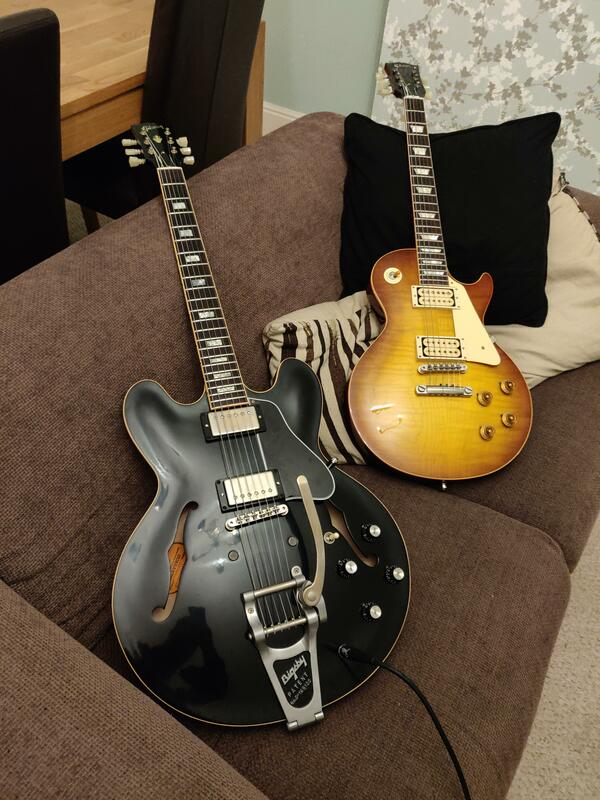 My 59 335 neck is the same size as the bigger R8s I’ve played. Think the 58 is similar. That looks awesome. Did you have a choice or tops or did you go to one of the branches? 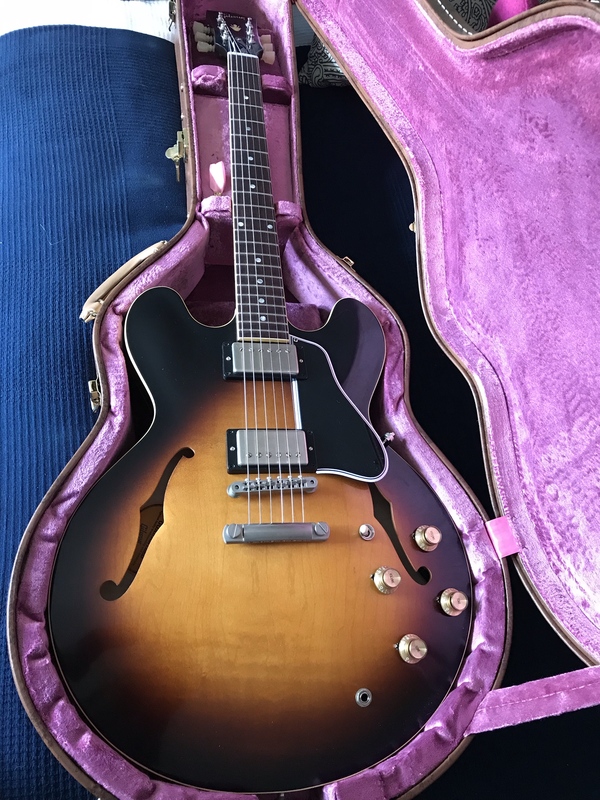 A deal to buy a tele fell through ‘‘tis weekend and I’m very tempted to try one of these instead of the neck is a little smaller than the 63 reissues. I got the guys in Glasgow GG to choose me the best one out of the 10 they had. I asked for most resonant, dark fretboard, interesting grain if possible and not too heavy. They did a superb job and came up with a right corker! The necks vary but are the same ballpark as the 63. Slightly smaller on average. Wildwood in the USA sell these same guitars and they publish the neck measurements so you can see the typical variation on their website. There’s not a lot into it compared to the 63s. Mine is 0.800-0.925 which is very typical 61 and would be a small 63. Yeh I find it quite useful just to see how much variance there is from guitar to guitar of what should be the same model. I’m lucky to have inherited some measuring calipers so I can measure my own guitar necks. It’s kind of nerdy but when I know I like (or don’t like) the feel of a neck it’s nice to know what it measures as. Marks guitar loft provide measurements too as do @guitars4you. The only criticism I do have is the setup was pretty awful when it arrived. Truss rod needed adjusting twice, and even when put right the action was still very high. Got it playing beautifully now though. You lot are a bad influence! Down side of having guitars shipped mate especially in this weather! Was probably okay when it left the shop. Going to have to get used to the rounded neck, I'm used to the plank on my R8 now. Do the historic reissues have square shoulders?